Like Verdi, and several other opera composers, Puccini occasionally wrote songs but his true metier was of course opera. However, one shouldn’t neglect his songs and, as we will see, there are several references to his operatic writing. The texts are of variable provenance: there are four opera librettists, some minor poets, three texts by Puccini himself and the two duets (tr 14 and 19) are settings of the Evangelist Luke and 6th century Latin poet Venantius Fortunatus. There are simple little songs like La Primavera and Ave Maria Leopolda but also big dramatic ones like Mentia l’avviso and grandiloquent patriotic ones Inno a Roma with fanfare like piano accompaniment. Canto d’anime to a text by Luigi Illica was composed in 1904 and the melody became a model for Rinuccio’s aria in Gianni Schicchi. In the next song, Sole e amore, composed in 1888 we find a blueprint for Mimi’s farewell in act 3 of La bohème. E l’uccellino is a lullaby written in 1899 while La Primavera, to his own text, was written probably while he was a student at the Milan Conservatory in 1880. Ave Maria Leopolda is a setting of a letter to the conductor Leopoldo Mugnone with greetings to his wife from Puccini’s wife. It is from 1896. Antonio Ghislanzoni wrote the libretto for Verdi’s Aida. The setting of Ad una morta! is from 1882. Morire? Was written as a contribution to a music album sold for the benefit of the Italian Red Cross towards the end of the Great War in 1917. The melody was reused for Ruggero’s entrance aria in La Rondine. Salve Regina is another setting of Ghislanzoni, composed in 1882 and here the accompaniment is played on the organ. A te is an anonymous text and it was composed in 1875, when Puccini was just 17. Casa mia is a setting of a popular nursery rhyme from 1908, while Sogno d’or is a poem by the son of Puccini’s sister. Puccini set it for the Christmas edition of a magazine in November 1912 and the melody got a second life in La Rondine. Terra e mare from 1902 is a dramatic song which sounds typically operatic and is fervently sung by Krassimira Stoyanova, who sings the big Italian opera heroines at the leading houses of the world. She is also cut out for the rather overblown Inno a Roma, which is the latest of the songs here, composed in 1919, when the Fascism was gaining power in Italy. Beata Viscera (1875) was probably written for Puccini’s sister Iginia, who later became abbess of a convent near Lucca. The text is from Luke 11:27 and the beautiful duet – where Ms Stoyanova sings both parts – is discretely accompanied by an organ. Avanti, “Urania”! was composed in 1896 for the launch of a ship named “Urania”, owned by a friend of Puccini’s. The melody has a vague air of Tosti but there are also elements that point forward to Tosca and Madama Butterfly, which were due within a few years. The little love story Storiella d’amore, text by Ghislanzoni, was composed in 1883 and six years later he was to reuse parts of it in a trio in Edgar. It is truly beautiful. Inno a Diana (1897) was written for Puccini’s hunting companions – Diana of course being the goddess of the hunt. Mentia l’avviso was composed in 1883 to a text by Felice Romani and is operatically dramatic. The melody was later used for Des Grieux’s Donna non vidi mai in Manon Lescaut. The final song, Vexilla Regis prodeunt, a setting of a 6th-century hymn, was commissioned in 1878 by a little church in a mountain resort near Lucca. Accompanied again by organ this duet is beautiful and noble. This collection of songs is valuable in many ways, not least to find out how many melodic motives later were recycled and developed in Puccini’s operas. Krassimira Stoyanova has a grand voice, vibrant, beautiful and expressive and she easily scales it down to the dimensions suitable for the simpler songs but used with impressive power and intensity for the more operatic items. Maria Prinz is a pliable accompanist and the sung texts are available at the Naxos website. 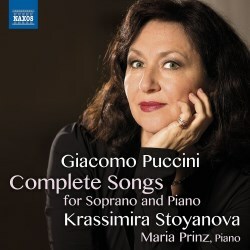 A valuable collection of rarely heard songs excellently sung by Krassimira Stoyanova.